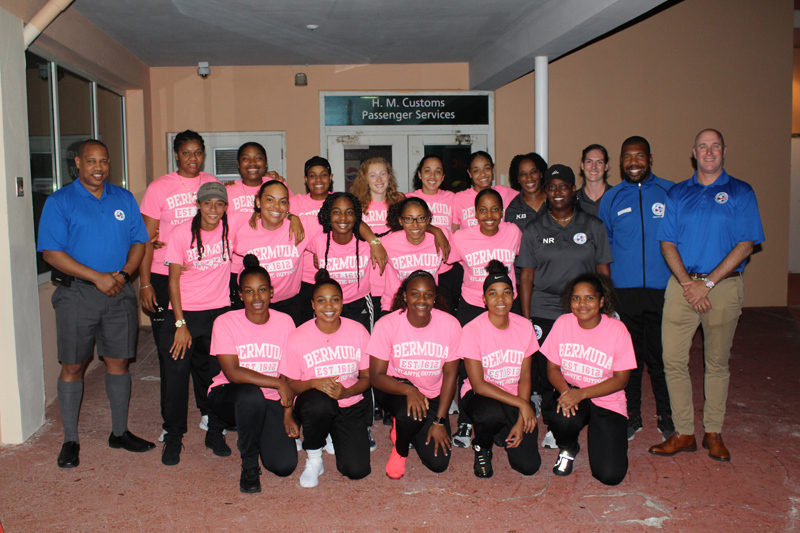 The Bermuda women’s football team returned home last night after they secured a place in the next round when they edged Suriname 1-0 during their final match in the Concacaf Caribbean Women’s Qualifiers. “Akeyla Fubert scored the lone goal in the 41st minute to power her team to seven points, fending off the challenge of host Guyana, which ended on five points after its 0-0 draw with Barbados in the final game of the four-team group,” Concacaf said. “Bermuda had opened its account in the playoffs with a hard-fought 2-2 draw with Guyana, then secured its first win of the campaign on Friday, clipping Barbados 3-2. “On day two of competition, the Guyanese were impressive by defeating Suriname 6-1 for their only win of the tournament. “Barbados took the consolation third spot with four points made possible with Sunday’s draw and Wednesday’s opening 2-1 win victory over Suriname. The latter failed to get off the mark. “Bermuda joins Cuba [Group A], Jamaica [Group B], Trinidad and Tobago [Group C], Antigua and Barbuda [Group D] as the qualifiers for the final Caribbean qualifiers slated for August 25 to September 2 at a venue to be named. “The top three teams in the final round will qualify for the 2018 Concacaf Women’s Championship from October 4 to 17 in the United States. Group A will be played in Cary, North Carolina, while Group B will be played in Edinburg, Texas. “The final stage will take place in Frisco, Texas, and the top three teams will qualify as representatives of Concacaf for the 2019 FIFA Women’s World Cup in France.